So the wheel has a name! 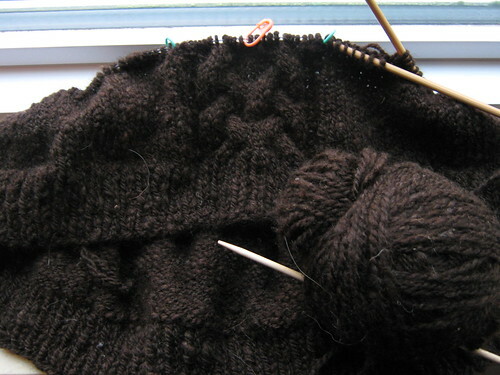 Thanks to the fine folks on Ravelry, I’ve come to know that he’s a Pirtle. So, he’s a 70’s-vintage guy, one of about 200 made by a retired Air Force engineer. 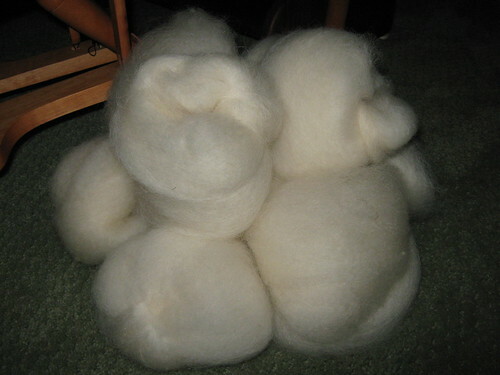 And I’ve just combed up another batch of Frank/Felix to spin up all nice and bulky on him. I took the cable motif from the Hand in Hand men’s cable vest pattern by Kathy Zimmerman. I think it’s working out nicely- it’s curvy, and large enough to stand out in the dark yarn, but still manly and subdued. No outside photos this week. It’s July, but feels like October. 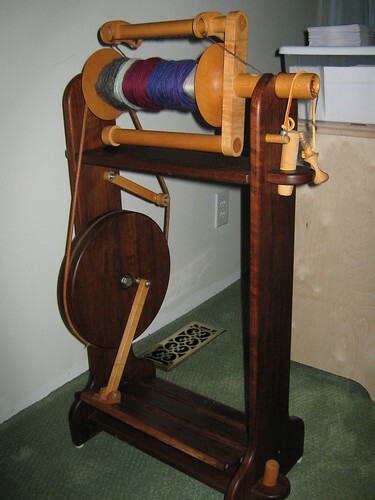 I’m a little confused about where you sit in orientation to the wheel to treadle. Maybe The Man would take a photo of you while spinning? I LIKE Irish tension (hence my Louet)! Lucky you , no summer! We are experiencing heat waves with almost 40 degree celcius humidex values. I would prefer it to be cooler rather than hotter. Wow those white puffs of your Shetland look fantastic!